April 2018 | Scarboro Garage Doors Ltd.
It’s not something you do very often. In fact, you’ll probably change homes more often than you’ll ever get a new garage door. And that longevity is both a blessing and a curse. The good part is that new garage doors are designed to last a very long time. Despite the fact that they are the largest moving object in your home, door designs, materials and technology have advanced to the point where most homeowners will only need to replace their garage doors once. But that infrequent need for a new door can be a bit of a problem. 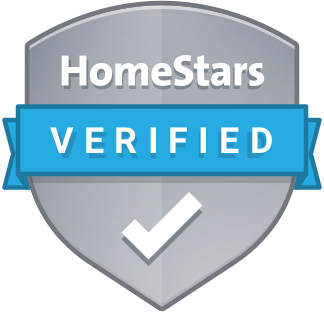 Primarily, because it’s done so rarely, most people are very unfamiliar with the process of finding, buying and installing a new garage door – or even when they should start the process. Instead, they start making subtle ‘adjustments’ in how they use the door. You know – you have to pull up on one side more than the other to make it open. Or you don’t notice the squeak that jars your neighbour awake every morning. But unknowingly putting up with the ‘characteristics’ of a too-old garage door is still not the most pressing reason to get a new one. Many of Scarborough’s famous bungalows and semi-detached homes were built in the 1950s and 1960s. And, incredibly, many of those homes still have their original garage door. Even if those doors still work properly, there are good reasons to change them. And if you’re suffering some of the other symptoms we mentioned above, which is why you’re thinking of replacing the door any way, the following points means you no longer have an excuse to avoid getting a new garage door. Most new garage doors are insulated. And most old garage doors aren’t. Few homeowners understand how much of the house’s heated and cooled air can be lost through an attached garage. Especially if you have a room above the garage, an insulated garage door keeps more of your heated and cooled air where it belongs: inside. Insulated doors also make your garage quieter; they give you the option to use the garage year-round as a work or recreation space; and they reduce the strain on your car’s engine during cold weather starts. Again, because we don’t replace garage doors often, and simply due to the size of the door (it’s big – it must be really expensive! ), most people over-estimate the cost of buying and installing a new door. Prices can vary, but your new door, even one that’s insulated, is probably more affordable than you think and can be installed in a day or less. New garage doors are well-balanced so that it takes very little effort to open and close them. Homeowners who have needed to replace their garage door openers often don’t realize it’s because the door is old and doesn’t move smoothly. That puts extra strain on the opener and reduces its life. So a new door will either save your back, or your garage door opener. Garage doors are the largest single feature on your home and can account for up to 40% of its look. In other words, installing a new door can be like re-doing a large part of the front of your home. Not only does that increase your home’s curb appeal, but, if you ever sell your home, you can bet that the old rusting door that you’ve been nursing for 20 years will be a huge turn-off for buyers. If you add the money you can save from reduced energy costs and the increase in home value that a new door can bring, it far outweighs the cost of the door – which, as you now know, is lower than you think. Has your garage door opener ever stopped working on its own? Or have you ever had your car stuck in the garage during a power outage because the opener wouldn’t work? Hopefully you don’t mind all the questions, but we ask them to make a point. While you probably don’t give it a second thought day-to-day, it’s when you suddenly can’t use your garage door opener that you realize just how much you depend on it. Fortunately, most name-brand openers are fairly reliable. That’s why we asked the second question above; because we knew there would be relatively few readers who have ever had an opener just plain stop working. Basically, there are three main reasons why, even if your garage door opener seems to work perfectly, that you should at least consider getting a new one. 1. Working or Working Efficiently? As one of those ‘old faithful’ appliances in your home, the mere fact that your opener continues to work is all the evidence you need to not get a new one. After all, why would you replace something that works? Yet, while it might be working, it might not be working efficiently, and that can mean it can be costing you a lot more than you think. In addition to newer models needing less power to do the same job, there’s no telling the inefficiencies that have crept into its operation over the years. For decades, garage opener technology changed very little. A new one usually had similar features as the old one. But in the last five or ten years, that’s all changed. Many of the technological advancements in today’s openers weren’t even heard of 10 years ago. And they mean that today’s opener gives you a functionality that makes your old opener obsolete. Like a lot of other appliances in and around your home, you can now monitor the status of your web-connected garage opener from anywhere using PCs, tablets and smartphones. So you can know if someone opens it while you’re not home – or, perhaps more importantly, if you are at home. And if a burglar manages to open your door and get in, you can close it remotely, potentially trapping the thief. Power outage? Nothing electrical will work, except your garage opener, most of which now come with battery back-ups. With security codes that change every time you use it, thieves can no longer just look for the most worn numbers on your keypad to find out how to open the door. Have you ever arrived somewhere and realized you may have left the garage door open? That means everything in your garage is in full view of the street and anyone can come a take whatever they like. Unless you have a remote connection so you can close the door. How many times have you gone into a dark garage and had to feel around in the dark to find the light switch? Not anymore. The last reason that you should replace your old garage opener has to do with convenience. If you think it’s inconvenient to do without your opener during a power outage, wait until it simply conks out on its own. While they can look similar to older models, new garage door openers give you more than enough reason to make the switch. So how’s your garage door doing? Chances are it’s working perfectly fine. Despite it being the biggest, heaviest moveable thing in your home, and that you use it a couple times every day, your garage door is remarkably reliable. Unfortunately, that steady dependability can lead to neglect. Look at it this way, compared to some of the other systems in your home, like the furnace, electricals or plumbing, how often do you do even the smallest amount of maintenance on your garage door? Don’t feel bad if you haven’t done any. Again, if it was properly installed, your door can work well for decades, even without maintenance. But that doesn’t mean that you can’t extend the lifespan of your door, or prevent problems from happening at the worst possible moment, by regularly doing just a few fast, simple checks on your door. And, considering it’s warmer outside, the spring and summer are the best times for garage door maintenance. Here’s a checklist of things you can do to give your door the attention it deserves and help to keep it working in tip-top condition for longer. Even if you take care to keep things out of the path of your door, it’s not a good idea to store anything even close to it. While a garage door opener has safety systems to reverse it if it hits anything or if it there’s anything in its path, hitting an object as it closes can eventually put it out of balance. The closer you store things to your door, the more chance there is that they may accidently fall into the path of the door or its rollers. Like any moving piece of equipment, it helps to keep your door well lubricated so it runs smoothly. Between it rollers, panels, hinges, springs, handles and so on, most people don’t realize how many moving parts are on a garage door. a. For metal-on-metal moving parts, like the hinges and spring assembly, a petroleum-based lubricant, like 3-in-1 or WD-40, is best. b. For rubberized parts, including the weather stripping between the door’s panels, along the bottom of the door and along the door frame outside the door, a silicone-based lubricant is best. Have you ever pulled into your driveway – it was probably pouring rain – and no matter how frantically you press the remote, the door refuses to open? There’s a good chance that it’s not the door’s fault. The problem is more likely that the batteries in your remote are drained. While it’s impossible to predict when batteries will fail, check the timing between when you press the button on your remote and when the door reacts. The longer the time, the closer the batteries are to failure. The systems we mentioned earlier that prevent the door from closing when anything is detected in its path, or when it contacts something as it closes, are very important for the personal safety of you and your family and to avoid any damage to your car or belongings. The first safety system, that prevents the door from working if something is in its path, are the door opener’s photo eyes. They are located close to the floor on both sides of the door inside your garage. If anything blocks the signal that passes between the eyes, the door will not work, or it will work briefly before reversing. To check that the eyes are functioning as they should, find a length of 2×4 wood, or anything else that will block the signal. Stand away from the path of the door and start it closing. Place the end of the wood between the photo eyes. The door should reverse when you do this. If not, the photo eyes should be inspected by a garage door professional. The second safety system can also be tested with a length of wood. With the door open, place the wood on the garage floor where the door touches the floor when it’s closed. Close the door. It should automatically reverse when it touches the wood. If not, call a pro. It probably took you longer to read this post than it will to check all the points that we mentioned. It’s not a lot of time to make sure your garage door operates safely and lasts as long as possible. There are a lot of great reasons to do as many do-it-yourself repairs around the house and garage as you can. First of all, you can save a lot of money, especially for more specialized DIYs like working on your car. Working around the house can be a great diversion from your day-to-day routine and it also keeps you more active and fit. But, unless you’re trained or very experienced in certain types of home repair, it’s not always a good idea to go the DIY route, regardless of the benefits. Electricals are an example. Not only do things need to be done properly using the right tools, but not following correct code and procedures could mean you end up hurting yourself, creating a fire hazard and risking the safety of your family. Most people wouldn’t say the risks of repairing their garage door are the same as the risks of wiring their home. First, there’s no danger of electrocution. Second, it’s a relatively simple mechanical thing – it opens and closes – so how difficult can it be? Unless it’s actually damaged in a collision or there’s a problem with your garage door opener, there are two main reasons that your garage door might need to be fixed. The most common problem is that it won’t open and close properly or at all, which means there’s a problem with the spring. The other problem, which doesn’t happen as often, is when the door doesn’t close evenly along its width, leaving one side open while the other side touches the ground. This is the result of a problem with the cables that help to lift and lower the door. The danger of fixing either of these problems on your own comes from the fact that, in both cases, the torsion spring, which is under a lot of tension, will either need to be replaced or adjusted. For this reason, we strongly recommend that you don’t attempt to fix your garage door yourself and use a professional door repair service. We’re not making this recommendation because we’re a garage door company and we’re trying to scare you into calling us. We make the recommendation because of the serious and costly dangers of replacing or adjusting a garage door spring. Even if you open and close your door manually, it so easy that the actual weight of the door can be deceiving. The truth is that garage doors can be very heavy, especially double doors. It’s the torsion spring that ‘balances’ the door so you can easily lift and lower it. Without the spring, or if the spring snaps or its tension is lost, the door would be much more difficult to open and could come crashing down with nothing holding it back. As the largest single moving thing in your home, and the speed at which it can close unexpectedly, there is a significant risk of injury when working on the spring, especially if you don’t have the right replacement spring and the training, experience and/or tools to install and balance it properly. And if you have a double garage door, you’ll have double the risk because, even if just one spring breaks, you should replace both at the same time to avoid repeating the whole process later. Even if you manage to not get clobbered by a suddenly closing door, the force of the impact with the ground could easily damage the door. And if you were actually able to install the torsion spring without a visit to the hospital, if you don’t balance it perfectly, it might not fully compensate for all of the door’s weight, which can put additional strain on your garage door opener and cause it to be repaired or replaced sooner than later. This one may not be a dangerous risk, but if one of the major benefits of DIY repairs is cost savings, then fixing your garage door is probably not worth it. When you combine the fact that you may not be able to use your door for some time, with the costs you’ll have anyway, like for a new spring (if you find the right one) or tools, the relatively small cost savings is not worth the risk – or the peace of mind that comes from knowing that, not only is your garage door properly fixed, but it’ll work safely too. If you have any problems with your garage door and/or opener, please give us a call at Scarboro Garage Doors. We offer same-day service to get your door fixed as soon as possible. Pity your poor garage door. Inside your home, you paint, redecorate and refurnish every few years, and outside your home you do some creative landscaping and are constantly tending the garden. But what about your garage door, the thing that works for you faithfully, going up and down on command, many times a day, protecting your car and belongings through wind, rain, snow and ice, year in and year out? What have you done for it lately?! If you’re like most homeowners, not only do you not ‘redecorate’ or ‘tend’ to your garage door, you probably haven’t even given it a good wash in recent memory, have you? 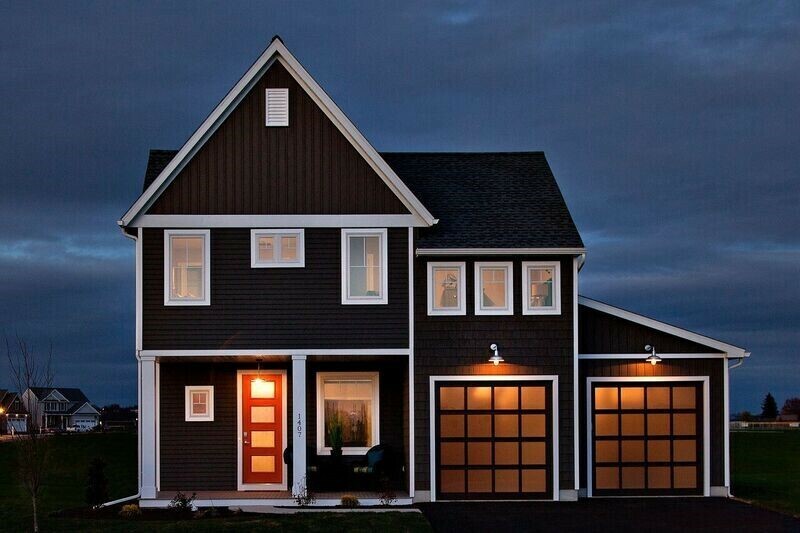 OK, forgive us for guilt-tripping you about your garage door. There’s a reason why you don’t pay it any attention. You don’t have to. Modern doors are designed and built to last and look great for many years. So why would you put in any time and effort to ‘tend’ to it – it already looks good (BTW – if it doesn’t, give us a call!). But that long-lasting reliability hasn’t stopped some homeowners from decorating their garage doors in some very creative ways, for a number of different reasons. Here a just a few recent examples of people who used their garage doors to express themselves – and even improve the curb appeal of their homes. It’s been used to fasten and/or repair just about anything in and around the house. Some people make iPhone cases from it. And well-known Canadian TV icon Red Green (aka Steve Smith) made it even more famous when he dubbed it ‘the handyman’s secret weapon’. But a woman in Cambridge, Ontario, put duct tape to work in a novel way of celebrating Canada’s recent 150th In an effort to win a neighbourhood competition for the best decorated house, Ingrid Talpak bought herself four rolls of red duct tape and went to work on her white garage doors. 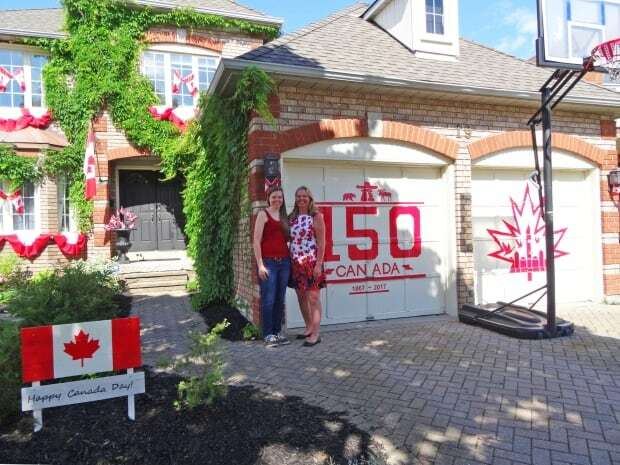 When she was done six days and 25 hours of work later, her two single garage doors were beautifully decorated with a giant maple leaf and Canada 150 motif. If you haven’t been down a Toronto laneway recently, you’re missing a feast for the eyes. Spurred on by organizations like The Laneway Project, and homeowner’s and graffiti artist’s desire to express themselves, the garage doors in laneways across the city are being turned into canvases for some beautifully creative artwork. As one example, in an effort to support the David Suzuki Foundation’s Butterflyway Project, an initiative to provide food and shelter for butterflies and bees in neighbourhoods across Canada (including along the Gatineau Corridor right here in Scarborough!) about two dozen garage doors were painted with butterfly-themed murals in a laneway facing Garrison Creek Park. We here at Scarborough Garage Doors stock only products from the leading garage door manufacturers in the business. Hass Door is one of them. Not only does their 360 Series aluminum garage door offer a wide variety of finishes (27 in all!) for you to ‘customize’ your home, but the company also offers a backlit option that makes the doors look like they are glowing at night. In a new residential development in Mount Joy, Pennsylvania, every home buyer so far has opted for the Haas 360 Door upgrade option. In addition to giving you an option for a distinctive look for your door, the lighting also improves night time safety and increases the curb appeal of your home. See what happens when you show your garage door some love? Many homeowners don’t think of their garage doors in the same way as they think of their regular front and back doors. Of course, they’re different, one lets people into and out of the house and the other is big enough for a car to drive through. But the differences shouldn’t really go beyond that. There’s no reason to think your garage door should be any less secure than any other door in your home. In fact, the garage is one of the most popular places for burglars to get into a house and one of the most popular ‘rooms’ to steal from. From bicycles and sports equipment to tools and snow blowers, garages can be chock full of valuable stuff that’s very attractive to thieves. So the argument can be made that the garage door protects your belongings almost as much as your entry doors. But you don’t install dead-bolt locks, chains and/or alarms on your garage door. The same thing is true for another difference between your entry doors and garage door. Would you ever install a front door that wasn’t well insulated? Not likely, but lots of garage doors aren’t insulated. However, like the security thing, it’s almost as important to insulate your garage door as it is to insulate your entry doors, or anywhere else in your home. Especially if your garage is attached to your house, an insulated door helps you save money in lots of ways. Especially if your garage is underneath a room in your house, the temperature in the garage can affect the temperature of the house. And that can mean more electricity or fuel used to heat and cool your home. An insulated door can keep garages significantly warmer in winter and cooler in summer. After being told that an insulated garage door would make a big difference to the temperatures inside his garage, a homeowner in Pennsylvania had one installed. To see just how much of a difference the insulated door made, the homeowner recorded some temperatures inside and outside the garage before and after the door was installed. The differences in the inside temperatures before and after the installation are remarkable. After installing the insulated door, with an outside temp of -5 degrees Fahrenheit, the temperature was 43 degrees inside the garage. That means, the insulated doors kept the garage seven degrees warmer, even though the outside air was 15 degrees cooler. By keeping your home cooler in summer and warmer in winter, not only do you save on energy costs, but your heating and air conditioning equipment will not switch on and off as often, or have to operate for as long a time. While it might start faithfully in even the coldest temperatures, that doesn’t mean your car doesn’t go through more effort during cold-temperature starts. The insulated door in the example above maintained a 48-degree difference between the outside and inside air, versus just a 26-degree difference for the uninsulated door. That means, in the uninsulated garage, your car is starting in temperatures that are about 10 degrees colder. If you ever sell your home, an insulated garage door can make a big difference in the price you get. As if it isn’t enough to show prospective home buyers that they can save energy costs, equipment costs and extend the life of their car, insulated garage doors also keep the garage quieter, they look better, last longer, keep out more pollution and give the option for using the garage for added living space in the home, like a playroom, home office or home gym. When you really look at the advantages, not having an insulated garage door seems as odd as not having insulated entry doors. If you are interested in having a new insulated garage door installed at your home, contact Scarboro Garage Doors today! You can also visit our showroom in Scarborough to view our selection. After we wrote the recent post about storage ideas for your garage, we got to thinking: why is the garage, which is probably the biggest single space in a home, so neglected when it comes to things like organization, and even renovations? It’s like the poor garage gets no respect. It does its job, day in and day out, the garage door going up and down on demand, protecting your car, sports equipment, garden tools, lawn mower, and who knows what else. But when it’s time to decide on which home improvement you’re going to tackle this year, has the garage ever topped the list? Has it ever even made the list? Yes, we’re playing up the ‘poor garage’ angle (maybe too much?! ), but we’re just trying to highlight the potential for one of the great spaces of your home. If you want to take that potential to the max, you can remake the garage into a space that’s on par with any other room in your house. With some insulation, drywall, a ceiling and flooring, you could have the coolest games room, home office or personal gym ever. But what we’re talking about here isn’t changing the garage into something else, but making it a more pleasant place to be while still delivering everything you need and like about having a garage. A place that, even though it’s still home to your car and equipment, you’re impressed and feel good when you walk into it. In addition to adding some of the storage ideas we mentioned before, here are just of few of the things you can do to help make the garage a better part of your home. Imagine if your bedroom had bare concrete floors and no plaster on the walls and ceiling. It’s a dreary sight, isn’t it? Now you know why your garage isn’t the most inspiring place in your house. There’s a reason your garage is that way. Basically, any place where you store a car, and the fumes and drips that come with it, needs to be bare so you don’t damage finished floors, walls and ceilings. But you can have the best of both worlds. On floors, which might have to handle dripping oil, an epoxy or polyuria coating is tough enough to handle anything you can throw at it while being available in a wide range of colours and finishes that can give your creative side an outlet. Similarly, finished walls and ceilings can be painted with the same easy-to-clean, moisture-resistant paints you use in the kitchen or bathroom. Yet another reason for the dungeony feel in your garage is the stark lighting. Bare bulbs or fluorescent tubes aren’t great at creating any kind of ‘ambiance’. Think about similar lighting as you might put in your family room, including pot lights in the ceiling and task lighting on work benches. This one won’t only make your garage look and feel great, it’ll boost the curb appeal of your entire home. During the day, glass garage doors let in a beautiful glow of diffuse natural light. At night, with the right interior lighting, they can emanate a similar glow from the inside out. Perhaps best of all, you’ll not be compromising the security of the garage or the durability of the door because the metal frames used in their construction make them just as strong as any other garage door. 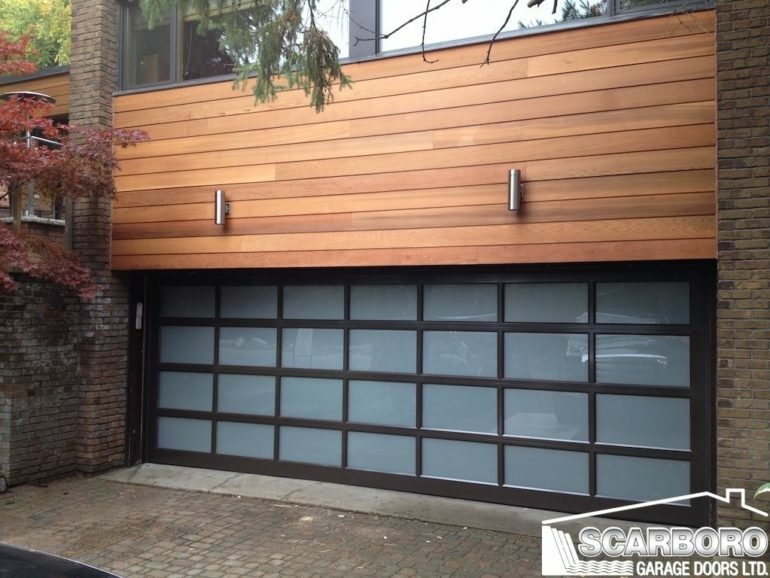 If you’d like to get more ideas for making the garage a place that you’ll want to hang out in, and to see a range of glass doors that’ll set-off your whole house, please call or visit us here at Scarboro Garage Doors. You can also fill out our online contact form to get in touch with one of our representatives!